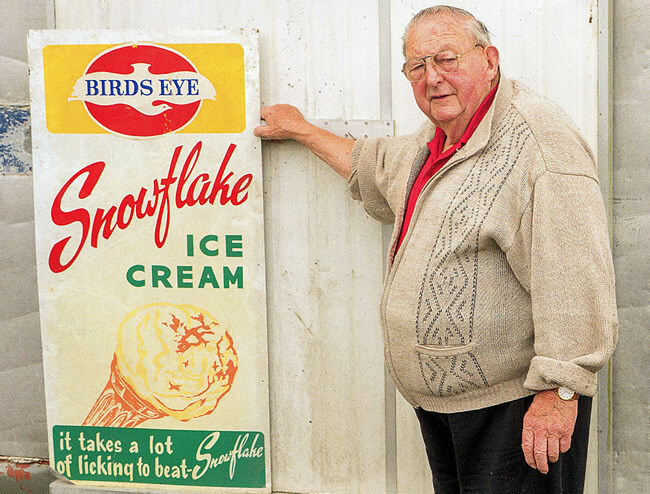 Owen Norton, whose family ran Snowflake Ice Cream for over 80 years. Photo - NZ Food Technology News. (February 2019) Owen Norton explains that his dad and uncle were the creators behind the famous Snowflake ice cream brand that was sold for more than 80 years throughout the West Coast. Laurence Norton and his brother Wallace began dairy farming in Greymouth after World War One. Owen says that his his dad and uncle would take their horse and cart into town, stocked with milk from their farm to sell to Greymouth locals. "They ended up with a surplus of milk and thought it'd be a good idea to make some ice cream." 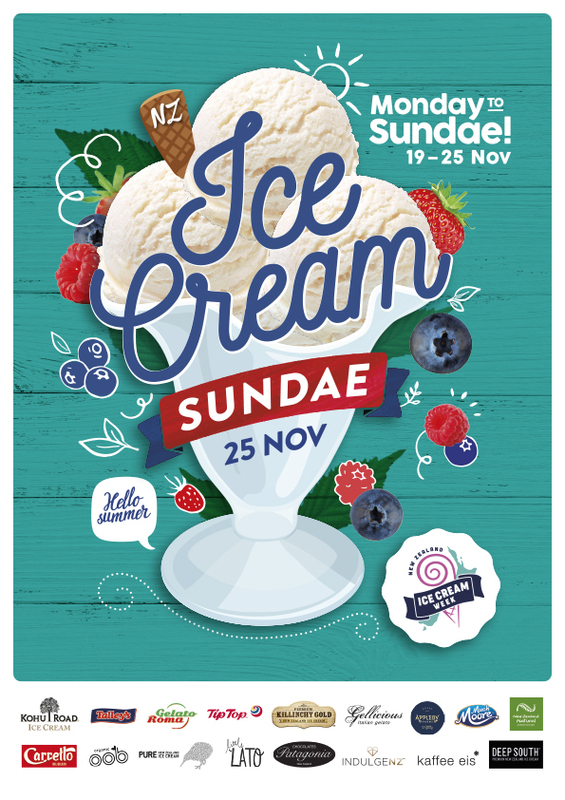 (15 Nov 2018) The New Zealand Ice Cream Manufacturers are holding their inaugural NZ Ice Cream Week from 19 November to 25 November, with Sundae 25 November being celebrated as NZ National Ice Cream Day. Look out for the special promotions being offered by our participating members during this week. Ice cream identities (from left) Jim Price, Napier's Lick This owner Steve Manning, Tom Hillis, and Blue Moon ice cream former owner Bruce Hastie. Jim and Tom used to sell Blue Moon ice cream in the '70s. Photo / Warren Buckland / Hawkes Bay Today. (29 Jan 2018 - By Astrid Austin) Local ice cream identities reminisced about the old days at Marine Parade's Lick This ice cream parlour yesterday. 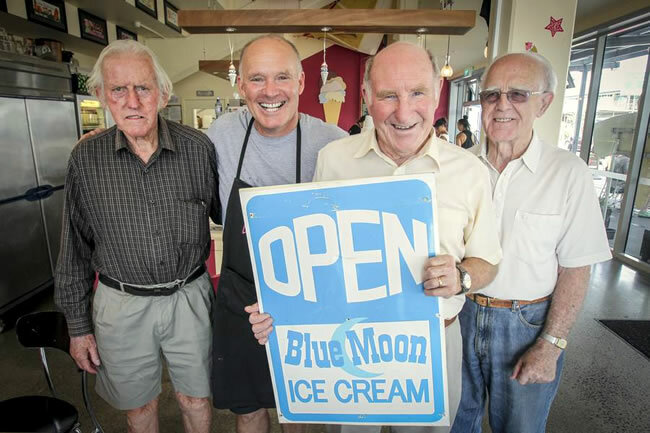 One of Hawke's Bay's most endearing brands of ice cream was Blue Moon. The business was sold to Bruce Hastie in 1957. Bruce was able to meet customers who had sold the Blue Moon ice creams - Jim Price and Tom Hillis - the first such meeting in several years. Lick This owner Steve Manning said he had been planning the reunion for the past six months. "It was a bit of a surprise for Bruce really to reminisce about ice cream and the old days. They enjoyed catching up and I think when they talked they started to remember things that they had forgotten." After sharing ice creams, they looked at Mr Manning's signage and scoop collection and Mr Price's old photos of his shop. 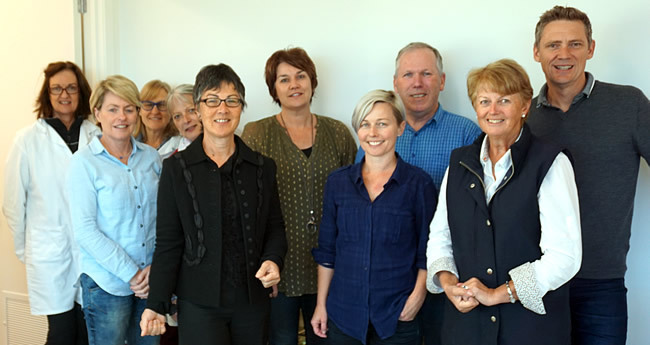 (26 May 2017) A record number of entries, 340, and a new Category (Non Dairy), meant even more work than usual for the team of specialist judges marking scores, awarding prestigious Gold and Silver medals, and deciding the winners in the New Zealand Ice Cream Awards this year. A team of eight took on the huge task, over two days: Michelle Sinclair, Auckland (Chief Judge), Kay McMath, EPS, Auckland (Deputy Chief Judge), Craig Davis, DuPont Nutrition and Health, Australia, Joanna Boese, Auckland, Nicola Hall, Auckland, Rosy Mitchell, Auckland, Sandra Murray, Auckland, and chef Geoff Scott, Auckland. (24 November 2015) New Zealand's favourite ice cream makers have been named in a new survey by consumer research and ratings company Canstar Blue, with some challenger brands performing strongly. Oob Organic, Rush Munro's and Tip Top all received five-star reviews from Kiwis for overall satisfaction, while Oob Organic and Rush Munro's also scored top marks for taste, as did Pams. The ratings are based on a survey of almost 1,800 consumers who have purchased and eaten ice cream from tubs in the last six months, with 14 different brands compared. "New Zealand is world-famous for its ice cream and exports it to all corners of the globe, but we wanted to find out which brands are most enjoyed at home," says Canstar Blue General Manager, Jose George. "We're a nation of ice cream-lovers and these results show consumers think highly of some locally-produced products. "Tip Top is the most dominant player in the market, but there also seems to be a strong sense of customer loyalty to some of the smaller brands. The results are particularly impressive for Oob Organic and Rush Munro's, both family owned businesses competing against the big boys"
Mr George added: "There are so many options to choose from in supermarket freezers and while most brands are deemed to offer good value for money, Oob Organic, Rush Munro's and Tip Top are standing out from the crowd. Ultimately, it's all about the taste." The survey found that one in three Kiwis (33%) tend to buy low-fat ice creams when available, while 50% read the list of ingredients before purchasing. "Interestingly older Kiwis are more inclined to buy low-fat products and to pay close attention to ingredients," said Mr George. "It seems young people are more likely to get lost in the moment and to put any thoughts of diets to one side to enjoy a treat." Taste is clearly the biggest driver of satisfaction for consumers when they buy ice cream, but the findings show packaging appeal is also a major draw. "When we're in the mood for ice cream, we tend not to worry about what it's costing us," added Mr George. "The brands are all competing to catch our eye when we're shopping, so it's interesting to find that packaging appeal is such a significant factor. But of course, just because an ice cream looks good on the outside of the tub, doesn't mean it will live up to expectations on the inside." Brian Simon is helping create a new ice-cream range for Dairyworks. He and his wife Jeanette were the founders of Deep South ice-cream, and earlier the Manda brand of icecream. Photo / ROBYN EDIE / FAIRFAX NZ. (16 May 2015 - By Phil McCarthy) Brian Simon dreams about making ice cream . And now the 79-year-old Manda and Deep South brand founder is back in the business, sort of, as the churns at the famous Rockdale Rd plant are turning again thanks to Christchurch-based company Dairyworks. Brian is on-site advisor to Dairyworks which in January started producing ice cream in Invercargill and is now pumping out 3000 2-litre containers a day. The ice cream is sold around the South Island at the moment, with plans to expand nationwide. The Simon name is steeped in industry tradition. Brian's father Max started the eye- catchingly named Phantazzi brand in Invercargill in the 1930s, then moved to Dunedin to start the rather more traditional sounding Newjoy . Brian went farming for about three years at one stage but "that was too slow for me" so he and Jeanette founded the Manda brand in the 1960s in Invercargill. The couple then started Deep South in 1978 and owned the well-known brand until 2010. 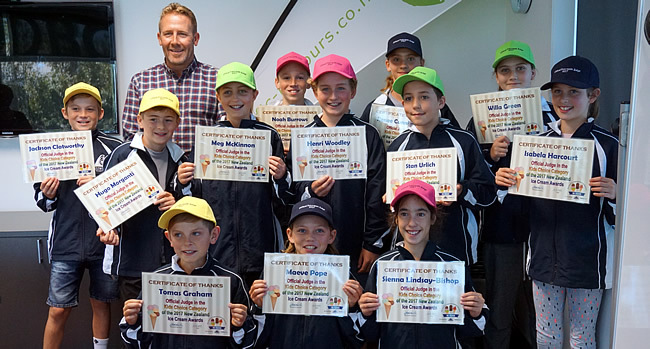 The 2018 NZ Ice Cream Awards were announced at the Awards Dinner on the evening of Thursday, 31st of May. Photos from the 2018 New Zealand Ice Cream Awards dinner and presentations. New Zealand’s childhood favourite ice cream flavour now available in all organic. 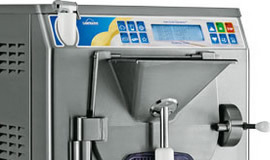 Carpigiani's Maestro combines pasteurisation and varied cooling/freezing all in the one barrel, without the need for separate pasteurisers. 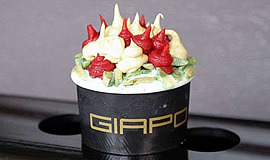 Travel site TripAdvisor rates Giapo Haute Ice Cream as the Best Restaurant in Auckland, and No. 1 ice cream parlour in the country.